Sharing our stories, actively listening to others, and exploring the thoughts and feelings that surface with the death of a loved one. These are an integral part of the healing process. BFO-Toronto support groups are based on the peer-to-peer model where people with similar grief experiences can come together to share, reflect, grow, support and inspire. There is something powerful about being with people who just “get it”. Closed groups at BFO are small, closed-membership groups of 8-12 people who have experienced like-losses and want to explore their grief in a confidential and supportive setting. The groups are facilitated by two peer volunteers, with similar losses, and are supported by volunteer professionals. Generally groups meet once a week, in 2-hour sessions, for 8 weeks. Open Group Programs at BFO are for any adult over 30 years of age who has experienced the death of a parent, sibling, or relative, or the death of a partner. BFO-Toronto peer volunteers who have experienced similar losses facilitate groups, which are open discussion format with no set topics. Attend as many sessions as you need. Please note that open groups are not drop-in based, and you must complete an intake before attending. Attendance lists for open groups begin accepting RSVPs the Sunday evening prior to group. RSVPs made before this will be asked to RSVP again starting Sunday evening. While we endeavor to accommodate all requests, open groups often fill up. To ensure a space in the group, please RSVP in advance. 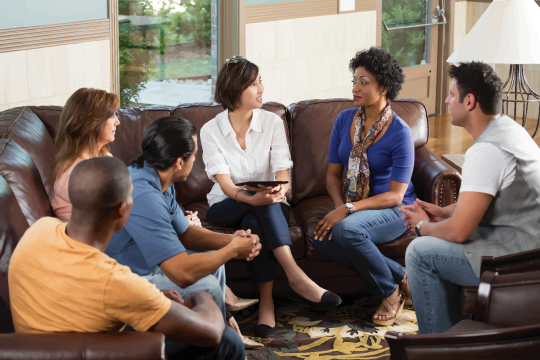 What does a support group offer? A safe space for you to explore your grief in whatever way makes sense for you. A space to connect, share, and listen with others in their grief journey. Develop skills, knowledge, and coping strategies to assist you in learning how to live with your grief. Am I ready to join a group? Am I ready to share my story with others? Am I ready to hear the stories of other bereaved people? Will my schedule allow me to regularly attend the group? Is this the right time for me to benefit from a mutual support group? Please call the office at 416-440-0290 to have your name added to the next available session. Please note that there is sometimes a wait to join a support group, as we run our groups when we have the optimal amount of participants.